Diego Costa may not be a Chelsea player for a really long time, but the striker continues to make headline even while chilling out with his dog. He has finally started pre-season training after his extended holiday... but he's still on the beach. The Chelsea striker has yet to return to Chelsea after his summer break in Brazil, while his team-mates are about 9,500 miles away in Singapore. With a Blues reunion very much not on the cards, Costa has been forced to improvise in order to get fit for the new campaign. Costa, whose agent(s) are working diligently attempting to work out a move for him to Atlético Madrid (or maybe AC Milan), has been having a good time in his home town where he grew up in Lagarto, Brazil for most of the summer. He was recently spotted training on a beach. 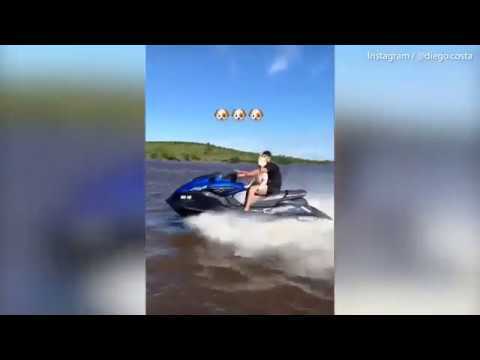 So after a hard day’s work of running in sand, the striker take a ride on the Jet Ski with his beautiful dog. DoglopedixDiego Costa may not be a Chelsea player for a really long time, but the striker continues to make headline even while chilling out with his dog. He has finally started pre-season training after his extended holiday... but he's still on the beach.